The world's consumers are changing, and businesses serving consumers must understand the drivers that will transform our industries during the rest of this decade and beyond. This week, more than 800 representatives from the world's leading retail and fast-moving consumer goods (FMCG) companies are gathering in Istanbul for the annual global summit of the Consumer Goods Forum. A more appropriate location for this year's conference would have been tough to find, with Turkey's economy growing by 8.5% last year and its retail industry expected to reach a turnover of $250bn (£160bn) by 2014. In these challenging times, as many parts of the world struggle to crack the code for growth, the insights of Turkey's home-grown businesses and entrepreneurs will be invaluable. In fact, the situation we find ourselves in today is not altogether dissimilar to when I joined The Coca-Cola Company in the late 1970s. At the time, a lingering recession was sapping US confidence; oil prices were soaring; and US workers were worried about their future livelihoods. Many feared a rising economic powerhouse - then Japan - might leave America in the dust. In time, the worst of these worries proved unfounded, as the US bounced back by adapting and innovating. And I believe many countries and companies similarly struggling today can do the same. To get there, however, companies have to understand the vast implications of the five mega-trends identified last year in the Consumer Goods Forum's report on the "Future Value Chain". More than half the world's population now live in cities. By 2050, this figure will balloon to 70%. This monumental shift will create significant supply chain and logistical challenges for consumer goods and retail industries. Our businesses will not only need to collaborate better with each other but also work more closely with cities as they modernise their infrastructures. The global birth rate has been declining for 20 years, and we're living longer. By 2047, people over 60 will outnumber those under 15. This will mean new opportunities for some industries, as more mature consumers tend to have greater disposable income. Along the way, we can expect more focused marketing and greater reliance on home delivery. The world is experiencing the greatest economic shift in history as the global middle class grows by another billion people in the next 10 years. With China and India leading the charge, more than 90% of the world's middle class will live in emerging markets by 2030, up from 50% today. While this new wealth represents a huge growth opportunity for manufacturers and retailers, it is also likely to create new resource stresses and cost pressures on some commodities. Many of the old rules and assumptions of our industries no longer apply. Consumer expectations are increasing while their tastes and preferences change at a dizzying pace. Much of this is driven by new consumer technologies. By 2013, for example, more than two billion mobile users globally will have made a purchase via their handsets. By 2020, a third of consumer purchases are expected to be made online. Ultimately, new ways of connecting offer fresh and exciting opportunities to engage with digital consumers and improve their shopping experiences. Even so, retailers and FMCG firms will need more advanced real-time insights to better serve this dynamic, fragmented market. One key will be to pick the right ways to interact with online consumers, manage these conversations appropriately, and make the best use of digital consumer data. Moreover, successful companies will need to enhance transparency and become more collaborative in their interactions with shoppers. Consumers today are understandably concerned about sustainability, as demands for natural resources continue to challenge supplies. By 2030, the world's population will reach 8.3 billion, boosting demand for food and energy by 50% and for fresh water by 30%. In this light, sustainability is simply smart business. At Coca-Cola, for example, we're reducing our eco-footprint and our reliance on fossil fuels with our PlantBottle - a fully recyclable plastic package up to 30% made from plants. We plan to use this technology in all of our plastic bottles by 2020, and we're working to accelerate development of commercially-scalable, bottle-quality plastic that's 100% made from plants. We're also striving to protect the resources that go into our products, starting with water. Since 2005, we've conducted 386 water partnership projects across 94 countries. These projects - which include watershed protection, rainwater harvesting and community water improvements - are good for our business and the communities we proudly serve. They are also moving us toward our goal of giving back 100% of the water we use in our products by 2020. Over the next decade, success or failure for consumer goods companies and retailers will be measured by the speed and thoroughness with which we're able to adapt to change at all levels - global, national, local and personal. With continuous innovation, companies that serve tomorrow's consumers will need to build more sustainable businesses; collaborate toward better optimised supply chains; and drive brand value and sales through greater engagement with increasingly sophisticated and tech-savvy consumers. I firmly believe there is a bright future ahead for those who can best adapt to our rapidly changing world. Investment, innovation and collaboration will be the watchwords for businesses, communities and nations that thrive over the coming decade. 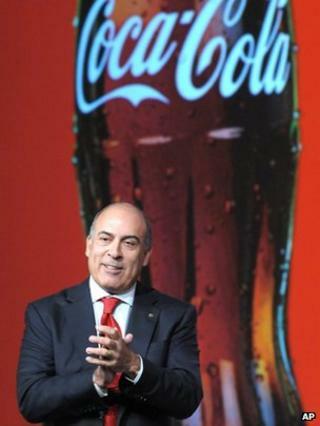 Muhtar Kent is the chairman and chief executive of The Coca-Cola Company, and co-chairman of the Consumer Goods Forum (CGF), an industry association bringing together retailers and manufacturers.